We have a lot of snow already, more than we usually have by now, and it really makes everything feel Christmassy. It's not December yet, though, which is always the real start of the Christmas season for me. Sure, I've played Christmas music a few times and I'm working on and thinking about gifts, but I always feel like Christmas starts when the calendar turns over to December. Right now, it's almost time for Christmas, but not yet. Next week is the start of Advent, the four weeks leading up to Christmas when we anticipate the celebration of Jesus' birth. I'll be sharing Advent devotions again this year, but before I do, today I wanted to share some thoughts about that 'almost, but not yet' feeling. Before Jesus was born, the people of Israel had been waiting 400 years to hear something from God. 400 years! And we think waiting four weeks for Christmas is tough, lol. Malachi was the last of the Old Testament prophets, the last one to declare God's word to His people and then the people waited. And waited. They knew there would be a leader coming someday, a ruler who would "stand to lead his flock with the Lord’s strength, in the majesty of the name of the Lord his God" (Micah 5:4), but they didn't know when this leader would come. Imagine how they must have felt as they lived under the rule of other nations, as they paid taxes to people who didn't serve God and as generation after generation passed. Waiting is hard enough when we know the end date. We know what we're waiting for and when it will happen. Whether it's Christmas, a visit from someone we love, a vacation we've been planning or just an evening out with friends, whatever we're waiting for has a scheduled date. The Jewish people had no scheduled date in sight. They simply had to trust that it would happen as God had promised. Does that sound familiar? It should! Before He left, Jesus promised that He would return to the earth someday, but we have no idea when that will be (see Matthew 24). He told us to be alert and to be ready, but not when it would happen. He even told us specifically that "no one knows the day or hour when these things will happen, not even the angels in heaven or the Son himself. Only the Father knows" (Matthew 24:36). It has been a lot time, but we have to trust that God will fulfill this promise, just as the Jews had to believe. God knows we don't like waiting and He knows we struggle with waiting over long periods, so He even assured us in the Bible that He hasn't forgotten His promise just because it has been a long time coming. In 2 Peter 3:9 we read, "The Lord isn’t really being slow about his promise, as some people think. No, he is being patient for your sake. He does not want anyone to be destroyed, but wants everyone to repent." We are in the "almost, but not yet" time of waiting for Jesus to come back. 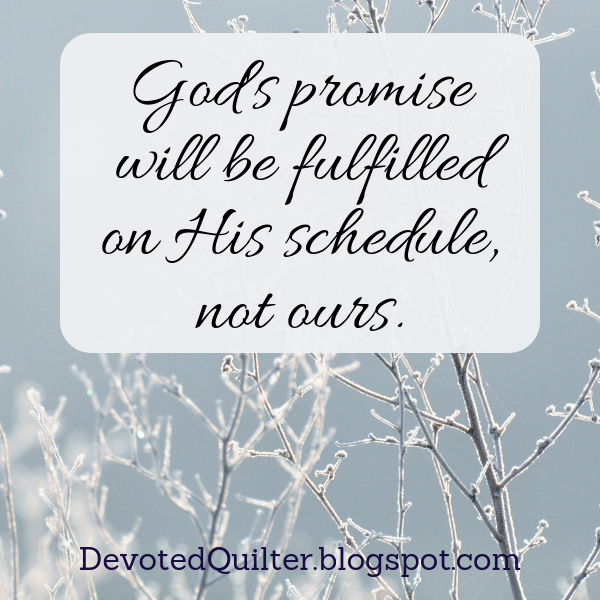 The promise will be fulfilled, but it will be on His schedule, not ours. We simply have to wait for the right time to come. Waiting for the births of my 3 kids was also a waiting game...! In our church, we're using the C. S. Lewis book "The Lion, the Witch and the Wardrobe" as a guide for our advent series. The one line that always comes to mind is "always winter, never Christmas" - it too reminds me of the unending (or so it seems!) wait... But he WILL come!